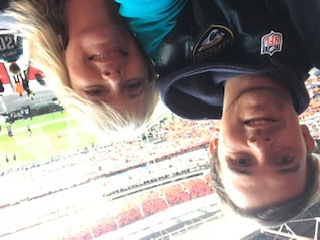 As part of our series in celebrating female NFL fans across the UK, I’d like to introduce you to Sarah Slade, a Miami Dolphins fan. 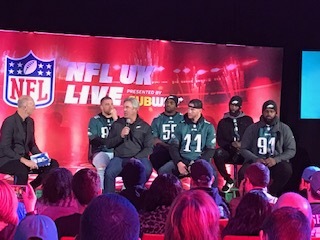 Sarah shares with us how she got in to the NFL, how she made the choice of her team as well as more about her overall experience as a fan. It all started with Ace Ventura and Dan Marino. 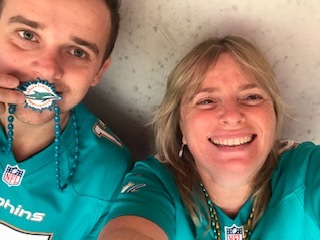 I didn’t have a clue who Dolphins were or what American football was but they were placed in a box in my memory, and then came flooding back at the end of 2013 having lost my dad and needing something new to focus on the NFL seed started its growth in me. 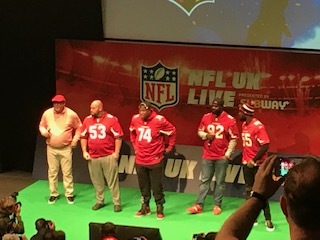 I booked international series season tickets and my obsession with NFL started and my love for my Dolphins. 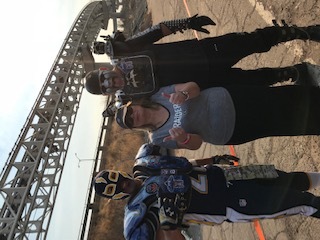 The first time I went to Wembley tailgating I could not believe how friendly all the team players were. Meeting fans, signing autographs. Nothing seemed to be too much trouble. 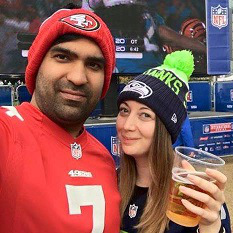 Supporters from all different teams, wearing their jerseys but all socialising before, during and after game. It just confirmed that this was a sport I was going to follow. 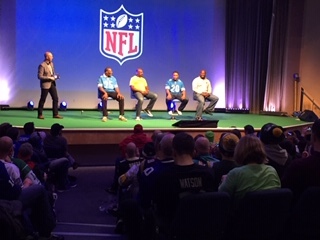 Meeting Dolphin players Ndamukong Suh, Jarvis Landry & Ryan Tannehill – I was full steam ahead supporting my team. 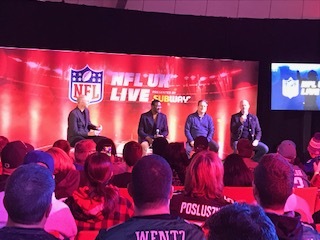 I’m always happy to see Neil Reynolds, Jeff Reinebold and my absolute favourite Kevin Cadle – I so miss him, he always seemed to remember you and even stopped me for a chat in Baker Street – still can’t believe that! I’m still as excited seeing a live game now as I was with my first. 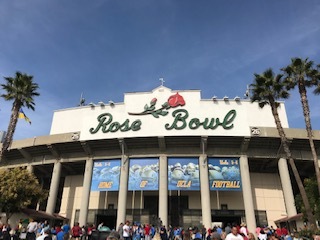 This year, I had a big birthday so I decided to treat myself to the gridiron Pacific Coast tour with Touchdown Trips – Four NFL games, two college games, tailgating, you can’t beat it in the USA and a group of strangers with NFL in common – what an amazing holiday. I have to say, the best ever. 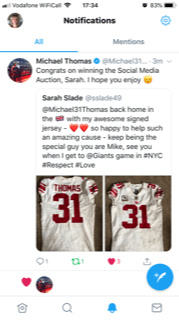 I was given a pitch side pass before the giants game from the amazing Michael Thomas #31. 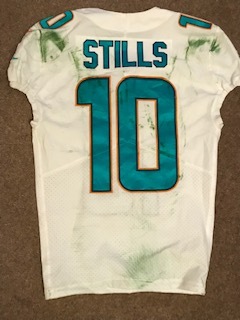 I had the winning bid on auction he ran earlier in the year for a Kenny Stills game worn shirt, and had again topped the bid while on our Trip for Michael’s own game shirt. 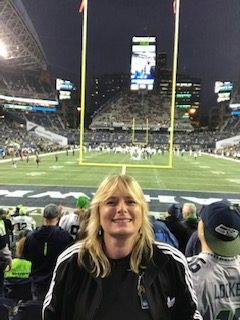 So he surprised me with the pitch-side pass. What can I say! 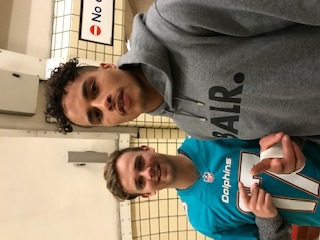 I met Kenny Stills in London before a game, he signed my game ticket and took a quick photo with my nephew. We helped him with directions to Wembley! What a genuine guy. 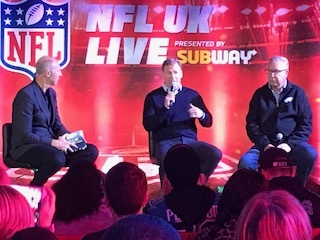 I cannot say how much NFL helped me through a rough time in my life and I have met so many lovely people involved in the game, as well as supporting the game. I now have a little knowledge of the game but am looking forward to learning so much more.